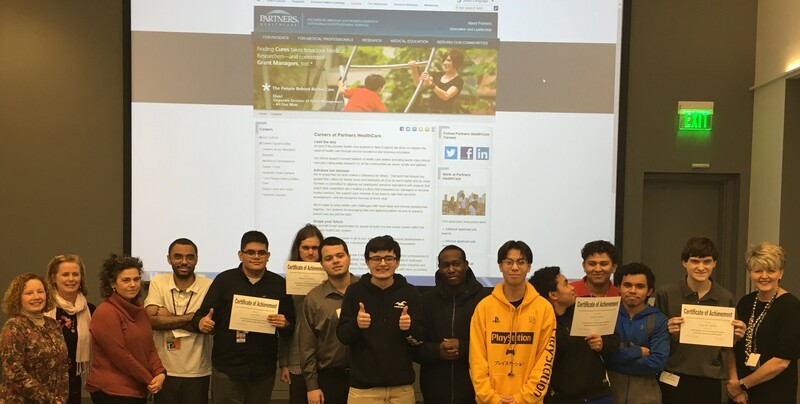 Campus Career Connect (C3) is an online group career readiness mentoring program that connects college students with disabilities in Massachusetts with professional mentors in the workforce to reach their career goals. Mentors help students on job readiness skills, networking opportunities and finding a job in a particular field. C3 participants can participate in webinars geared toward discussing pertinent employment-related topics such as: acing a job interview, navigating the work environment, requesting accommodations, financial literacy, resume building and interview skills. Work Without Limits is pleased to partner with Partners for Youth with Disabilities on this innovative project. For more information on the C3 project, contact Kathy Muhr, Work Without Limits Director of Community Engagement. 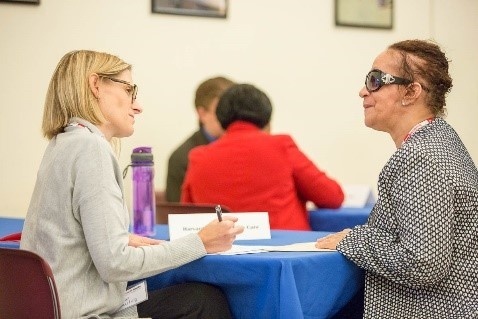 Campus to Careers connects college students and recent graduates with disabilities seeking meaningful internships and careers to leading employers recruiting for top talent. Work Without Limits is pleased to collaborate with the National Organization on Disability on this innovative pilot program. For more information on this project, contact Kathy Muhr, Work Without Limits Director of Community Engagement. ICAN is designed to introduce high school students with disabilities to a wide range of companies with opportunities for jobs and/or internships in their area. Selected students attend approximately 5-7 sessions hosted by businesses in the local area to learn about different industries, occupations, and work environments. While not a guarantee, it is the goal of the participating companies to either hire qualified students or graduates into paid internships or jobs depending on the interests, skills, and preferences of the individual. Work Without Limits is pleased to partner with the Massachusetts Advocates for Children on the ICAN project. Contact Kathy Muhr, Director of Community Engagement for more information. A graduation was held on January 4th for 20 students from Somerville High School and Full Circle as participants of the Somerville ICAN (Institute for Careers and Networking) program, a collaboration of Massachusetts Advocates for Children and UMass Medical School’s Work Without Limits. The ICAN program introduces students with disabilities to a range of companies who are all committed to including people with disabilities in their workplaces. Participants learned about different industries, occupations, and work environments. In addition, the program offers students the opportunity to make professional contacts at participating companies that they can leverage as they transition from school to career. Throughout the fall, Somerville ICAN participants had an opportunity to visit 5 exciting companies representing different industries; Cambridge Health Alliance; CVS Health; PwC; Vinfen; and Partners HealthCare. Students were able to see first-hand what it is like to work at large corporations, a hospital and a non-profit agency. This was a great opportunity to get a feel of the various career paths that lay ahead of them. While visiting the companies, students took part in a number of activities that included a company tour, learned about current hiring practices, job and internship opportunities, and the technical and soft skills needed for success. Though not a guarantee, it is a goal of the participating companies to either hire qualified students or graduates into paid internships or jobs depending on the interest, sills, and preferences of the individual. Employment can enrich the lives of people with disabilities by providing better financial security, and more fulfilling personal and social experiences. The Social Security Administration (SSA) understands this and knows that many people with disabilities who are seeking employment face unique barriers. To reduce some of these barriers, Social Security created the free and voluntaryTicket to Work (TTW) program that provides supports for individuals receiving Social Security disability benefits based on their specific needs and employment goals, as well as payments to organizations or employers who are assisting or employing them. Individuals with disabilities often receive Social Security Disability Income (SSDI) and/or Supplemental Security Income (SSI) benefits in the form of monthly payments from Social Security. Individuals between the ages of 18-64 who receive SSDI or SSI benefits are automatically eligible to participate in the TTW program. Under this program, individuals can connect with (“assign their ticket to”) an approved employment service provider (EN) of their choice. However, Social Security’s rules about working while receiving benefits are complex and often result in confusion, frustration and multiple questions around how working can and will impact public benefits. One of the challenges for ENs under the TTW program is understanding the work rules and complexities of Social Security’s disability benefit programs. Another challenge for ENs is the significant amount of administrative resources it takes to manage and implement the TTW program, including but not limited to requesting and tracking payments from SSA. Many employment service providers and employers do not have the time, capacity or expertise to operate successfully as an EN, therefore, have decided not to participate in the program at all. As a result, they forego the SSA outcome payments that they could be drawing down through the program for the work they are already doing supporting and/or hiring individuals with disabilities. This is where Work Without Limits comes in! Work Without Limits builds the capacity of employment service providers and employers to help advance the employment of people with disabilities. We fill niche needs that are not being filled by any other entity. In 2014, Work Without Limits recognized the educational and administrative challenges associated with the TTW program and created the Work Without Limits Administrative Employment Network (WWL AEN). To learn more about becoming a partner of the WWL AEN or making a referral, contact Peter Travisano, WWL AEN Program Manager. The WWL AEN provides each person who enrolls in our AEN with long-term and intensive benefits counseling. We work with individuals every step of the way as they transition from being on public benefits to fully relying on income from work, which is the goal of the Ticket to Work program! The WWL AEN specializes in navigating the Social Security system, answering the complex questions that arise, and more! For information regarding “assigning your ticket” (making a self-referral) to the WWL AEN, contact Barbara Lee, WWL AEN Intake Coordinator. 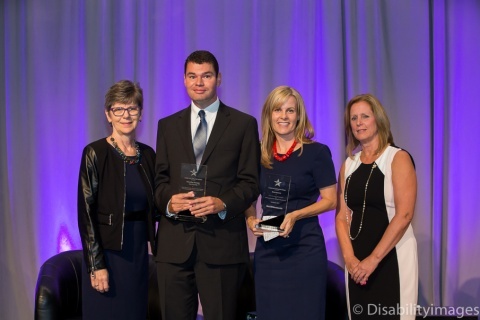 Partners Healthcare and Spaulding Rehabilitation Network have always been proudly committed to disability inclusion. We’ve demonstrated this though our active participation in programs such as Project SEARCH, our partnership with the MA Rehabilitation Commission (MRC), our membership in the MA Business Leadership Network (MABLN) and our service with numerous disability employment organizations. Increasing the employment rate for individuals with disabilities across our organization is a valued goal to help us mirror the patients we serve as well as to drive innovation for future patients and the community. 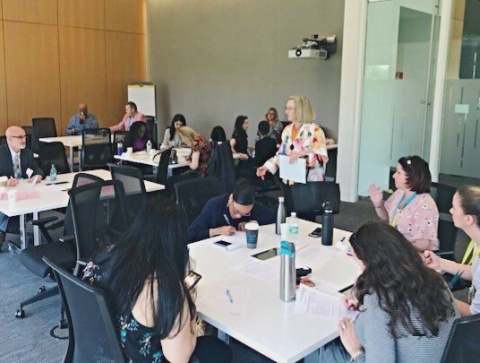 To help us sustain and further develop our existing efforts, we were excited to offer a three-part Disability Inclusion training series specifically for our Partners Continuing Care (PCC) Human Resources and Partners HealthCare Talent Acquisition teams. 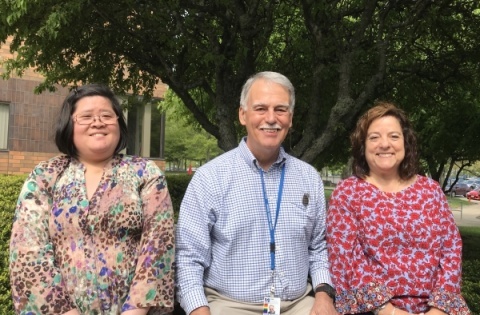 Provided as part of our ‘Campus to Careers’ partnership through the National Organization on Disability and Work Without Limits, this training strengthened our employees’ knowledge and confidence around inclusion for people with disabilities at work. Delivered in one-hour sessions, the participants learned through discussion, interactive exercises, demonstrations and case studies. The fast-paced variety of content and learning styles kept our interest and provided opportunities to practice a sometimes intimidating and what could be high-stakes topic, in a safe and supportive environment. The areas of Disability Sensitivity, Disability Etiquette and Interviewing Candidates with Disabilities provided a toolkit of resources and hands-on experiences to develop skills and confidence for our teams. A very encouraging and unanticipated development happened at the end of the first training when the Vice President of Human Resources for PCC inquired about offering this exact series to the full complement of managers and leaders throughout his organization. Before the conclusion of the initial hour he had seen the value for himself, his team and for the system. Bonnie Rivers from Work Without Limits was our lead trainer and did a great job of presenting the material in a friendly and instructive manner. As a supplement to the course content, she provided insights, anecdotes and coaching on various hypothetical situations. Throughout the experience, the participants felt supported and comfortable to ask questions in an open and non-judgmental environment. Feedback from our participants was consistently positive with 100% indicating all 3 trainings “met my needs” and “would recommend to my coworkers”, emphasizing how much the team was learning and how helpful the informative and material was. We feel empowered by what we now know, are better prepared to provide comprehensive service to employees of all abilities and look forward to our managers engaging in the same experience! Contact WWL to explore training and/or consulting options that best fit your organization’s disabilty inclusion goals! On May 12, 2018, I celebrated my ten-year anniversary at Eversource Energy. These years have been filled with learning, increasing my skills, and giving 100% to each job I am assigned. I am a senior customer service representative who utilizes Braille and text-to-speech technology to provide thorough assistance by phone and e-mail to colleagues and customers. By answering coworker’s questions about the adaptive methods I use, I strive to break down barriers, and make the workplace inclusive for everyone. In the Eversource residential contact center, representatives handle three call types: moving, billing, and emergency. When I was hired, Eversource implemented the JAWS (Job Access with Speech) program and scripted it to translate the database screens used for moving calls. Typically, moving calls is not overly complex as it usually entails just cancelling service for a person leaving an address, or establishing service for a new resident. I realized moving calls could be monotonous, and requested that the database be programmed for billing calls. These calls are more involved as customers question their bills, and seek suggestions for lowering energy consumption. After feeling comfortable with billing scenarios, I asked to be trained on emergency calls. These calls are potentially life threatening as people could be reporting a gas leak, or a person could be trapped in a vehicle with wires resting on it. Each call is different which makes the workday pass quickly. In 2017, the residential call center sought to hire a senior customer service representative. To be qualified, a person must be in the call center for three years, and must pass a stringent written/oral exam. I applied, worked collaboratively with management and human resources to make the study materials accessible, and began feverishly studying. When delivering the oral presentation, I used Braille notes, and ensured my notes corresponded with the slide on the screen. Fortunately, I passed the exams, and earned the position. As a senior customer service representative, I am now able to provide one-on-one training to other representatives, and handle escalated customer calls, which the original representative couldn’t resolve. I am grateful Eversource chose to hire me in 2008. Their willingness to make software accessible, and openness to my opinions when I’m challenged accessing a program, are traits which I appreciate. According to a 2016 study by Chicago Lighthouse for the Blind, people with disabilities are more likely to stay with a company, and frequently have lower absenteeism than employees who are not disabled. This same study indicates that employees with disabilities bring a unique perspective, and increase the diversity of a work place. I hope my commitment to diversity, and my overall career at Eversource continues for a long time to come. Although the weather was rainy and dreary the day of Friday, April 27th, Eastern Bank was full of sunshine and admiration. Friday, April 27, 2018 was Disability Mentorship Day (DMD) at the bank, a Work Without Limits initiative I had been coordinating along with my co-worker Chrissie Stevens. DMD is a large-scale national effort sponsored by the American Association of People with Disabilities (AAPD) for students and job-seekers with disabilities. I am new at the bank and this was my first time coordinating DMD and I did not know what to expect, but I was so pleasantly surprised! The day began with Chrissie and I greeting our two mentees in the lobby of our Lynn office and introducing ourselves. Chrissie works in Human Resources and I work in the Operations Division. The mentees spent the day shadowing the Operations Division and meeting leading managers in Human Resources. Being the assistant to the Director of Operations, I stayed with the mentees throughout the day to guide them to the multiple departments and introduce them to their mentors. The mentees went through 8 departments, where each mentor explained the functions of their department and their impact on the overall production of the bank. Throughout the day, the mentees were engaged and asked insightful questions. It was impressive to witness the mentees connecting all of our various departments to one another, and taking what they learned from one mentor and applying it to the department they just shadowed. From breakfast to learning about loans to lunch to International Operations, I saw our mentees as the striving young professionals they truly are, not just individuals with a disability. Throughout the day, we discovered that the three of us had many similar interests. Personally, we shared a love for Italian food and Mary Poppins. Professionally, we bonded over administration and finance. Although the day was intended to benefit for the mentees by providing education and networking opportunities, I felt like I was the one gaining and learning! Individuals with disabilities are capable of so much more than sometimes society credits them for. I am so thankful to have been educated by this program brought forth by Work Without Limits, but most importantly, our two mentees. Thank you for opening my eyes and all of those within the Operations Division and more at Eastern Bank. It was truly one of the most rewarding days of my professional career. John Hancock participated in the 3rd Annual Disability Mentoring Day (DMD) on April 27, hosting students and job seekers with disabilities for hands-on career exploration and mentoring opportunities. DMD is a large-scale national effort sponsored by the American Association of People with Disabilities (AAPD) to promote career development for young professionals with disabilities. For the third year, Work Without Limits (WWL), an initiative out of the University of Massachusetts Medical School, is partnering with AAPD to bring DMD to Massachusetts. The experience is mutually beneficial for both mentors and mentees, leading to personal growth, career development and the chance to learn from someone they may not have crossed paths with in their daily lives. But don’t take our word for it –let’s hear from them about their DMD experience! Why did you sign up to participate in DMD and what did you gain from your experience? Ruta: I was a mentee in the program three years ago and now I am working at John Hancock, so I participated as a mentor this year to help give someone else the same opportunity I received. I am hoping that by sharing my skillset and experience with Brien, it will help him succeed in his career. Mentee: I wanted to try something new and expand my horizons. Ruta: Brien has been very engaged throughout the day, asking a lot of questions about my job and what I do. It’s really great to see him so excited to learn. Brien: Ruta is a great mentor, so my favorite part of today is learning all I can from her. Eileen: I really enjoy volunteering and helping others, so this seemed like a great opportunity to not only do that, but also share my professional skills with someone just starting out in their career. 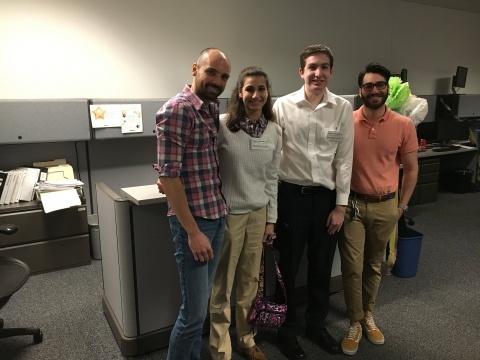 Will: I thought that DMD would be a unique chance for me to learn about the corporate environment and culture –and it has been! Eileen: Meeting all the mentees and mentors from other areas of John Hancock and learning about their interests both professionally and personally. Will: At lunch we got to meet not only other DMD participants, but also other people from John Hancock who provided us with some tips and advice when it comes to resume building and interviewing. It was great to network and meet people from across the company. Maria: I really enjoy volunteering and helping others, so this seemed like a great opportunity to not only do that, but also share my professional skills with someone just starting out in their career. Mario: I thought that DMD would be a unique chance for me to learn about the corporate environment and culture –and it has been! Ben: This was truly an opportunity to be supportive and engage members of the community to help with inclusion, diversity, and employment equality. 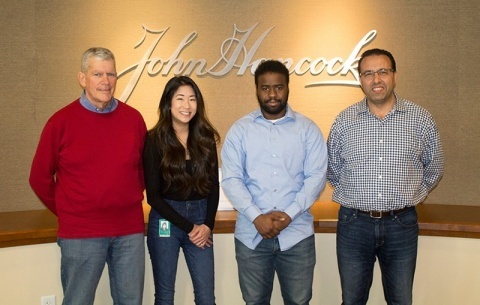 Terry: My favorite part was seeing the excitement in Selamani’s eyes at being given an opportunity to see what we at John Hancock do to delight our customers. It wasan honor meeting Selamani! I hope he keeps in touch, as I sent him an invite on LinkedIn. Also, he is a brilliant young man who will likely never stop learning and helping others. I told him to always remain unflinchingly committed to following his dreams and aspirations, and to always bring his true self to wherever he goes. Selamani: I now have a much better appreciation for the call center because of my exposure to what goes on behind the scenes. It was eye-opening to the entire customer experience, and the employees’ knowledge humbled me. Also seeing how representatives navigate their systems while interacting with the callers was simply amazing. Emily: My favorite part was lunch time. Not just because my stomach was growling and I really wanted a sandwich, but because Selamani had grown comfortable with me and we were able to talk about his love of soccer, his experience having been born in West Africa and his thoughts on the peace treaty between South and North Korea. We dined with some other managers from Life and Long- Term Care so that Selamani could network and hear their experiences. The day was a success and I was honored to host Selamani. Ben: My favorite part of the day was meeting and getting to know Selamani! He is absolutely delightful and a pleasure to talk to! Terry: My takeaway from the experience is twofold. One, plans don’t always go as planned, so you have to be flexible and go with the best plan. Two, there is tremendous joy in volunteering, and I always get back lightyears more than I give. Selamani: Other than hanging out with my mentors, I enjoyed seeing Pindrop in action, and how involved the Call Center is when it comes to protecting customer information. I also loved attending the live training session and seeing the new employees doing a live mock call. On Friday April 27th the 3rd Annual MA Disability Mentoring Day (DMD) was held at UMass Medical School on both campuses. There was a total of eight mentees and our IT department had the privilege of mentoring three of them. The event, organized with the help of Work Without Limits and UMMS HR department, provides the platform that matches people with disabilities (mentees) with working professionals (mentors) who share their experience and provide guidance to their mentees. For this year’s event our three mentees were Christina Scott, Michael Leonard, and Christian Lutbert. From the start they all seemed to enjoy their time with our IT family – getting to know our colleagues from different teams, groups, and leaning about the different types of jobs within IT. However, jobs titles and responsibilities weren’t the only topics that we went over with them. Along with representatives from HR, we all shared how to prepare for an interview, focusing on the importance of not only on hard skills but also soft/people skills. Some of us shared our personal stories of how we got to where we are, how we have stumbled, and how we picked ourselves back up and succeeded. Before leaving South St., Christina and Michael, had the chance to use a Virtual Reality headset, which seemed a lot of fun for them. Furthermore, at the Medical School, Christian got to meet Sujitha Chandra Kumar, who was an Intern in IT and is now an employee. We were all happy to be part of Disability Mentoring Day. Initiatives such as this not only allow us the chance to provide guidance to our mentees, but also learn ourselves how to be better mentors and give back to the community. Thank you everyone that helped and made Disability Mentoring Day happen! We are looking forward to taking part again next year. Michael is a Computer Science Major with a Minor in Management Information Systems. He graduated from Eastern Connecticut State University last May and is currently looking for a job in the IT field to satisfy his computer science skills. Christina is a hard worker and loves to work with a team and bring motivation. She is a junior in college at Framingham State University, studying marketing, and a huge sports fan. Christian is a wonderful young man who will be graduating from Quinsigamond College this month with a degree in Computer Science. He likes helping others and would like to find a job that allows him to do this as well as become self-sufficient. Jobs Without Limits (JWL) is a free online job board that was developed by Work Without Limitsto help connect qualified job seekers with disabilities to leading disability inclusive companies that are Sponsors of Work Without Limits and therefore committed to diversifying their workforces. Launched in the summer of 2015, JWL was beta tested by job seekers with disabilities, whose feedback was used to enhance the ease of use, navigability, and function of the job board. Though it is always a work in progress and we continually enhance the functionality to best meet the needs for both candidates and employers, JWL offers candidates with disabilities a safe place to self-identify and disability-inclusive employers to actively seek diverse candidates. As a large part of my role at Work Without Limits, I manage the Job Board. I am always available during regular business hours, 8am-4pm Monday through Friday, and/or by email after hours for any questions job seekers or employers may have. To see the growth, response and employment success for both candidates and employers has been very rewarding for me. Please contact me at any time. At present, Jobs Without Limits has over 4,000 currently available jobs postings from over 30leading disability inclusive employers throughout Massachusetts that represent a wide range of industries and occupations including accounting, education, finance, healthcare, insurance, manufacturing, retail, and retail banking. Jobs are automatically “scraped” from employer databases to ensure they are accurate and current. Opportunities range from entry to professional level as well as internship opportunities. Over 200 candidates are currently seeking opportunities on the Job Board – approximately 50 have college degrees, 20 have Masters degrees and over 40have 10+ years of experience. There are jobs for every education and experience level, so get those resumes posted and become an Employer Sponsor to gain access to this talent pool! Jobs Without Limits has many features for both job seekers and employers. These features include banner ads to highlight local disability service organizations, internship opportunities, hot jobs, and local disability and diversity related events. An employer page lists all the employers on the site, and provides information about each company. A community partner page lists and describes the different organizations, including state and private agencies as well as educational institutions with which Work Without Limits partners to source qualified job candidates. Sponsoring employers have unlimited posting capability. They can search the candidate database, run reports of candidates (including targeted reports of those candidates that have specifically clicked through to their job postings), manually add job postings and at certain levels of sponsorship, they can tag specific postings as “hot jobs” to come up first in a candidate’s search. A similar dashboard feature for jobseekers allows users to upload resumes to the searchable database, edit their profile, and run reports of job postings they’re interested in. We recognize that job seeking and hiring is not typically a quick process, but we do our best to keep the conversation going – and even get it started – between potential candidates and employers. Upon request, a unique service I provide to individuals who apply for a job via the job board is to send a personalized email introduction to the employer. We have deep relationships with our Employer Sponsors and providing this “warm handoff” is very beneficial to both parties! Additionally, to keep job seekers and providers informed, each month I create an e-newsletter that provides job search tips, informative articles, highlights of hot jobs and internships, and lists local disability and diversity events. If you are a job seeker with disabilities or an employer seeking a talented candidate and you haven’t checked out Jobs Without Limits yet, go take a look around, sign up, or contact us for more information! You might just find the candidate, or employer you have been looking for!